She's really so cute, and I love her dress... so I vectored her! After I made a BG in keeping the original idea (from the scan), in changing curtains (vectored from a photo found on the net). I tried different versions (by day, by night, ...) and I finally chose this one. I like the town by night (that show well the anime)! WOW! I really like this one, city night scape is just awsome and chii like always is some hot stuff. i really recognice that twin towers and the right tower lol. OVerall very nicely done, I just find that the vectored windows on the buildings in the skyline are to saturated and they are to smooth, they do not blend in with the buildings, they just seem to be lying on top to me. Is it just me that I find the reflection in the window in an odd position? And the hair should be reflected from that angle instead. And I agree - Chii's dress is cute! Its beautiful! i love your wallpapers! Great job on the lighting in this, I love the colors and the background as well. Good work. Chii is so cute... and myabe I'm strange, but I love the pairing Fay x Chii! Great picture. Chi looks beautiful! 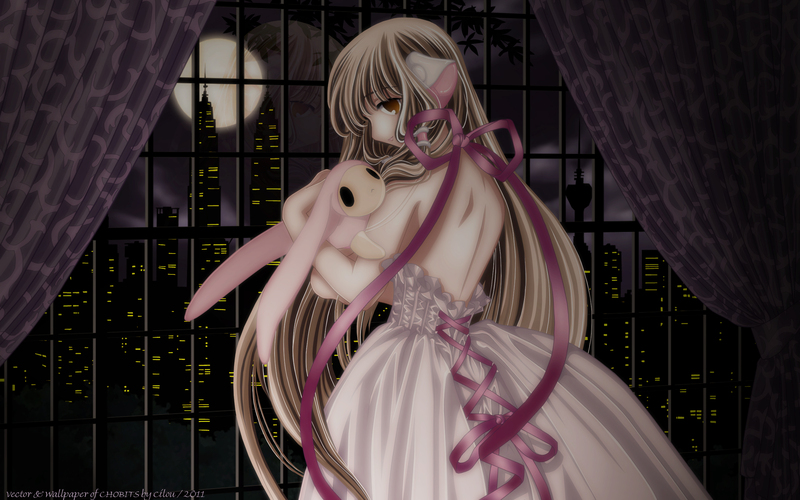 Espectacular dibujo de Chi de Chobits , gracias por compartirlo. I love your wallpaper in both versions! Chii's so kawaii in that scenery! congratulations! Beautiful wallpaper ! Chi is so Kawaii ! Thank for the job !